The hiking map for the most spectacular island of Cape Verde. 1st edition 2016. The hiking map for the biggest island of Cape Verde. With rip-proof paper! For explorations on the island with an active volcano. The most detailled map for the desert islands. Tropical Storm Fred, who was briefly graded up to a hurricane, has brought the Cape Verde heavy rain and squalls of over 100 km / h. The popular with tourists fishing pier of Santa Maria on the island of Sal has been damaged. There were uprooted trees and flooded streets. Fortunately so far no casualties were reported. According to the Observatório Vulcanológico de Cabo Verde (OVCV) measurements of SO² emissions in the last 4 days put close that the eruptions below Pico do Fogo may be regarded as finished. This should make tourist visits in Cha das Caldeira soon be possible again. For visitors to the Caldeira, there will be a newly introduced fee (approximately 4.50 EUR) from 1 March 2015 of 500 CVE. 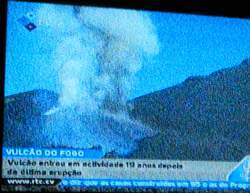 On 23.11.2014 at 10 am in the morning, there was a volcanic eruption below the Pico de Fogo. 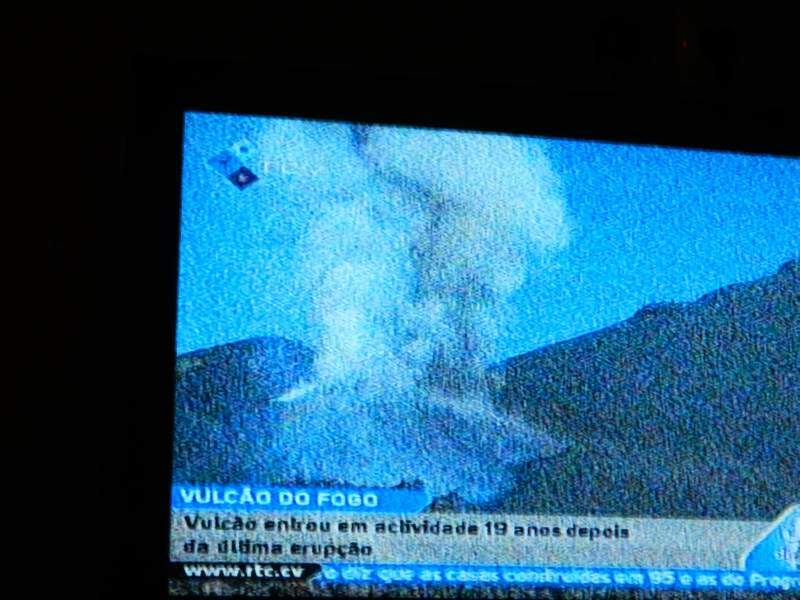 The eruption occurred approximately at the location of the outbreak of 1995, at the Pico Pequeno. The island was evacuated and the Cha blocked for some time. The lava flowed in two directions: on the one in the direction of the entrance to the Caldeira, of the other in the direction of the village Portela. The first homes have already been destroyed, including the 2014 newly built visitor center, approximately 300 meters before the village. Nowadays it is possible to drive into the entrance of the Caldeira and see the unique natural spectacle. At the moment is not yet known when the eruption stops. It is to be hoped that the current vulnerable place Portela remains intact. The previous messages in the media about the destruction of the place are partially wrong or exaggerated. A new editon of my tourist map for the Capeverdean Islands is available now. The predecessor map in the scale 1:200,000 has been completely revised and updated for the larger scale of 1:150,000. The map is now also printed on tear-resistant paper. The map is particularly suitable for trip planning, for island hoppers and as a road map. Price: only 8.80 EUR plus shipping from Germany. For family reasons, the calendar Cabo Verde 2014 is a little later than usual this year. The calendar Cabo Verde 2014 can be pre-ordered now. Shipping is approximately from mid-December. It again contains 12 very typical motifs of the Cape Verde Islands. The price is still € 9.90 (delivery within Germany) or € 12.50 (European countries), including shipping costs. Quantity discounts on request. The hiking map Santo Antao will be available again from 23 April 2013. The reprint includes a few updates and is printed on tear-resistant paper. Please note: On-site in Cape Verde may be short-term delivery problems because the stock is currently mostly sold out. Due to the unexpectedly high demand this winter, the hiking map Santo Antao is sold out and temporarily out of stock. The map is still available in the port of Porto Novo on Santo Antao, at the tourist office of Lucete Fortes! A re-print will be produced as soon as possible. Despite the 1-2 defeat against Cameroon, Cape Verde has just qualified for the first time for the Africa Cup 2013. The surprising 2-0 first round victory of the Tubarões Azuis was enough for the qualification of the team from the Cape Verde Islands. Our hiking maps can now also be ordered via Amazon.co.uk. Shipping and payment handling will be fulfilled by the well established Amazon-Services. As this is a new service for me, please be patient with possible start-up difficulties. The navigation device manufacturer TomTom is seeking candidates for his so-called "Map Project Paradise". For each project up to five people can apply, who would be ready to explore for two weeks all corners of one of five islands and thereby acquire data for navigation systems. The trip costs are covered by TomTom, plus they pay 10,000 €. The application for the Cape Verdean island of Santiago is possible from 12. july until 25. july 2012. The other islands of the project are Fiji, St. Lucia, Mauritius and the Seychelles. The application period lasts 2 weeks for each destination. Go to the TomTom "Map Paradise Project"
The Kriol Jazz Festival will take place in Praia from 12 to 14 April 2012. The festival was named one of the 25 best international festivals by British music magazine Songlines. The program includes a tribute to the late singer Cesária Evora and appearances, among others, by Mayra Andrade, Mario Laginha, Manu Dibango, Sissoko Ballaké & Vincent Ségal, Mirri Lobo and Sia Tolno. The private airline Halcyonair continues flight operations from Monday, 13th February. Flights go to islands of Sal, Boa Vista, Sao Vicente, Fogo and Santiago. The reasonable priced alternative to TACV stopped flight operations due to financial difficulties. The most famous singer of the Cape Verde Islands, Cesaria Evora, died on Saturday, 17.12.2011 from an acute severe heart and respiratory failure. Source: A Semana - Cesária Évora has left us. 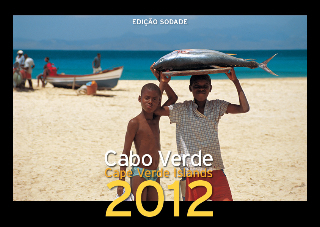 The calendar Cabo Verde 2012 by photographer Marit Roloff is now available. The new ferry "Tuninha" runs once a week the route Mindelo - Sao Nicolau - Sal - Boa Vista - Praia and back and can accommodate 150 passengers and 40 cars. More information about this in the online newspaper A Semana Cape Verde in Portuguese or in the automatic translation by Google. The second Edition of the hiking map of Santo Antao, by Dr. Pitt Reitmaier and Lucete Fortes and in my own publishing company is now shipping. Besides small updates, the 2nd edition corrects the error of the hard to find hiking trail numbers of the first edition. First: From 02.12.2011 to 11.12.2011 is the kite surfing world championship (CSF Cabo Verde) held at the Ponta Preta in the vicinity of Santa Maria. It is worthwhile to bring telephoto lens and tripod. Second: From 18.01.2012 until 27.01.2012 crosses a because of its well-known green sails distinctive sailing ship before Sal: The "Alexander von Humboldt II" . Many know the ship from numerous adverting videos for brand of beer from Bremen where Joe Cocker shouts Sail Away. In a runoff election on 21 August 2011 was the opposition leader of the Liberal party, the Movement for Democracy (MDP) was elected new president of the State of Cape Verde. He succeeds the president in office since 2001, Pedro Pires (PAICV) from. According to independent observers, the election was free, transparent and equitable manner, confirming again the status of Cape Verde as a politically stable democracy. More detailed reports on the subject in english at BBC News. From 1 July 2011, the Portuguese airline TAP flies two times per week from Lisbon to São Vicente. The flight is especially interesting for those who want to go to Santo Antao without stop on Sal island. Drawback is the stopover in Lisbon, an airport that has the reputation for common problems with connecting flights.